Artists often do open studio days but the real gem for art collectors and artists is the private and personalized studio visit. I do a few of these each year and I treasure every one. How it works is an interested art buyer or small group of collectors emails or phones me to set up a private studio visit to our home and my studio space. I ask a few questions about what they are interested in viewing and set up our space to accentuate these interests. This weekend my visitor was interested in my paintings and in particular in finding one for a new art space that was created as part of a recent renovation of her home. As a result of this visit, a painting that was released just last week will be going to live with this new collector in British Columbia, Canada. This painting is going to go to a place where it will be loved and appreciated for many years into the future. The new owner tells me how she can see already how much this painting will change as the light changes. 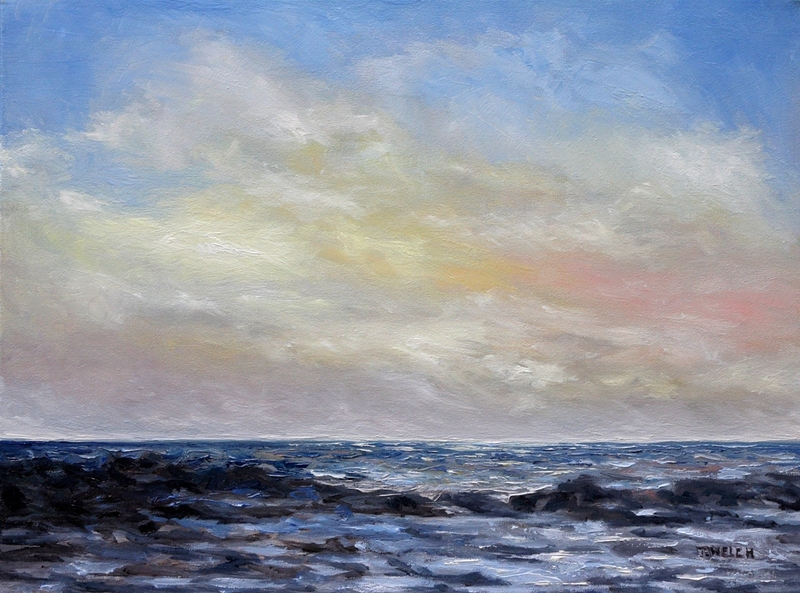 She is imagining how her family will watch the painting and notice different aspects at different times of day – a practice that is not really any different that watching the sea itself. Feeling a sense of peace and being in alignment with my purpose in the world, my husband and I went out for a late lunch to celebrate at the Bennett Bay Bistro. The deck overlooking the bay is divine mid-afternoon. Upon returning home the phone rang. A breathless request zipped through the lines from a collector in Alberta, Canada. She wanting to know if the painting ISLAND WITH THE LIGHTHOUSE was still available and if so, could she to buy it. I had just posted the painting for sale the previous day in the Artsy Home gallery and I hadn’t even had a chance to put it up on my Terrill Welch Artist website. ISLAND WITH THE LIGHTHOUSE 8 x 10 inch oil on canvas. I said it was and yes she could buy it. Full of emotion she explains how every Sunday she goes to the Artsy Home online gallery to see what new work I have posted. 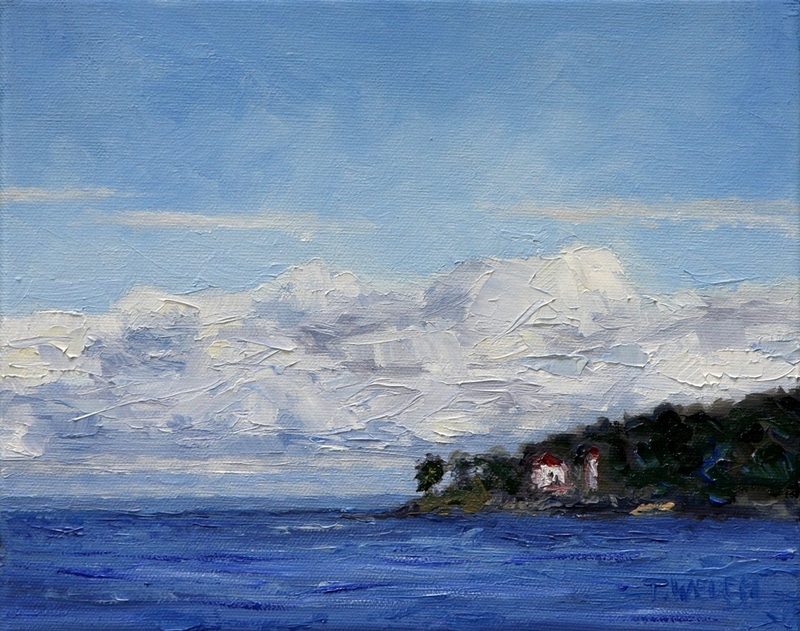 When she saw this small painting of the Mayne Island lighthouse as it is seen from the ferry, the experience brought tears to her eyes. Her husband noticing her reaction and said he would buy the painting for her for her birthday. At this point I had a lump in MY throat and tears in my eyes. To think that such a small painting could have such a significant impact on others! My inspiration for this painting comes from describing where we live to others. The southern gulf islands are not always easy to name individually if you are unfamiliar with how they relate to one another. Mayne Island is often described as the island with the lighthouse as it is viewed from the ferry traveling from Tsawwassen to Swartz Bay on Vancouver Island. This small window to the sea is what you might view on a fine day from that ferry as you near the entrance to Active Pass. What is YOUR most treasured way to share your creative results with others? Thank you dear readers as always for your ongoing support and comments here on Creative Potager. It is an honour and a pleasure to visit with you from my art studio and home on Mayne Island on the southwest coast of Canada. Thank you for the lovely tour, Terrill. It’s always so enjoyable visiting with you. And your painting ‘Island with the Lighthouse’ makes me proud to be a Mayne Islander. You are most welcome Leanne and a pleasure to visit with you as well. Yes, I am sure our paths will cross particularly on these fine days we are having. I can see the wee apples forming on the trees now, and the blossoms from you brush are still my focus for my meditation. Working on being self validating right now….sunshine and the garden full of roses (27 bushes in bloom this week) are just the perfect surround to my journey. One neighbor off to Morocco and my other neighbor just home from Paris ( his poetry won him a trip for a workshop) celebrating with them, and with you over the release of 2 paintings to lovely places…WOW what a day/week! Terrill – If we were to view earth through a starship lens, we’d see vivid sparks of color all over the globe where your artwork resides. My website and Facebook both provide links to the articles I write. And then, of course, there’s my blog where I get “up close and personal” with readers each and every Tuesday. I suppose that is true Laurie though there are places that still need to be lit up 😉 I so enjoy all of the places and ways you share your creative results with others – in fact I count on these opportunities to offer fulfillment in my everyday. Thank you! I loved the studio tour! What a lovely home you have, and the paintings are truly marvelous. What a joy it must be to live in such a beautiful place and to have at your fingertips the ability to display your vision and inspiration on canvas for others to enjoy with you. Truly enjoyed this. Thank you. You are most welcome Deborah. If you are ever over this way, feel free to call and set up an in person studio visit. Most fun!